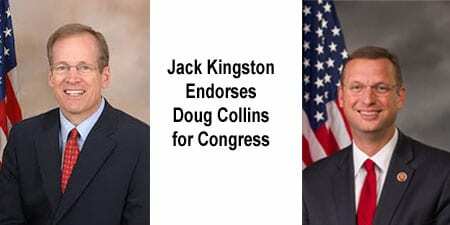 Gainesville, GA., April 18, 2016 – Former US Congressman Jack Kingston today endorsed Doug Collins for Congress in the May 24th GOP Primary. Kingston served along side two of the candidates in this race in the US House of Representatives. He also volunteers his time serving as the Foundation Chairman for the Georgia Republican Party. “Men like Doug Collins are a rare breed in Washington. What you see is what you get with Doug. He stands up for what he believes in and he represents common sense 9th district conservative values” said Jack Kingston. “Jack Kingston served alongside me and my opponent from the 10th District while we were all in Congress. Jack calls it like he sees it and I greatly appreciate his support so that I can continue to serve Georgia’s 9th District. His fundraising for the Georgia Republican Party will help keep GA red and make sure that Hillary Clinton is defeated this November,” said Doug Collins.